It’s always nice to see our work in print, so thank you Andrea Manley for including some of our projects in your article on green roofs and living walls in this months issue of Grand Designs magazine. The article features an image from the very first wall I created in Hackney, London back in 2009 . The living wall was part of what turned out to be a pretty amazing roof garden that featured a glass bottomed pool, polished concrete fire pit and of course, the ultimate accessory, a fully stocked bar! On our tour of London last week I was delighted to see how well our living walls are doing, so much so, I wanted to share another image. This time it’s a wall we installed this time last summer in Belsize Park. An essential part of what makes any garden or living wall interesting is the plant selection. Finding and testing out new plants is an exciting, fascinating and important job. I love discovering a new nursery and nothing can quite beat the tingle of excitement brought about by the anticipation of stumbling upon a new plant. I’m relatively fresh to the world of plant hunting, so I’m constantly ‘stumbling’ across lots of plants that I am unfamiliar with… or to be more honest, have simply never heard of before. Shame on me. However, plants are not something to be scared of or worried about using. They are to be picked up, paid for and whisked home to gaze upon for several minutes, hours or indeed days, before inserting into a new planting scheme. The pleasure of watching a new plant working it’s magic amongst other beauties is simply one of the great joys of my life. I am always happy when I’m planting. That’s why I constantly have mud under my finger nails. I know spring brings lots of beautiful blossom to our streets and gardens but for me there are plenty of trees that don’t really bloom and are just as good. 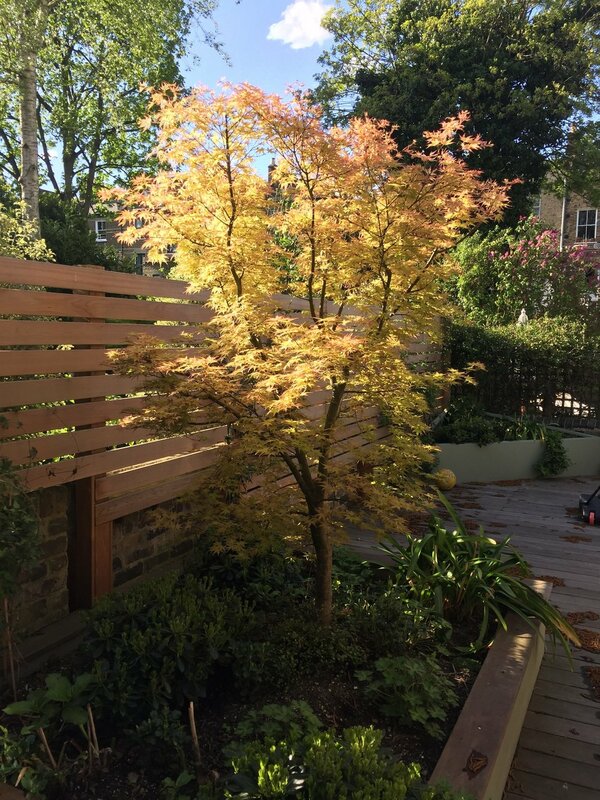 The colours of this Acer Palmatum “Beni Tsukasa” are almost autumnal but yet the tree still carries that same springtime sense of new life and optimism for the summer ahead. The blue sky helps a bit too. An olive tree. Well nearly. With business booming and hundreds of meters of living wall to create, Adam has fallen behind on his weekly blog posts. A long way behind. I have agreed to step in and lend a hand. For my first post I thought I should write about my own living wall which we created almost exactly a year ago. The living wall is located in our side return and is in full view from our large kitchen windows. This spring it has proven to be a massive distraction for my children with meals and homework endlessly interrupted. The reason? Well we have had robins nesting in the corner of the living wall and so every time they swoop in or out we all look up and watch the robins. They don’t like to leave the nest for more than a few seconds at a time so the distractions are pretty much constant! If you look closely you’ll see the mother tucked away amongst the Asarum caudatum. Beautiful. Fairy wings or horny goat weed? I love Epimediums. Also known as barrenwort, bishop’s hat, fairy wings, horny goat weed or yin yang huo in Chinese. The majority of species come from China with a huge range of forms and species, many of which make a great choice for my living walls as they prefer a moist environment. Handy. They can be evergreen or deciduous and there are so many to choose from it makes my eyes water. I’ll be testing various varieties in my living walls throughout 2018 and will, I’m sure, slowly edit my selection down to a half dozen… yeah right, as if… make that two dozen. They’re just too fabulous. 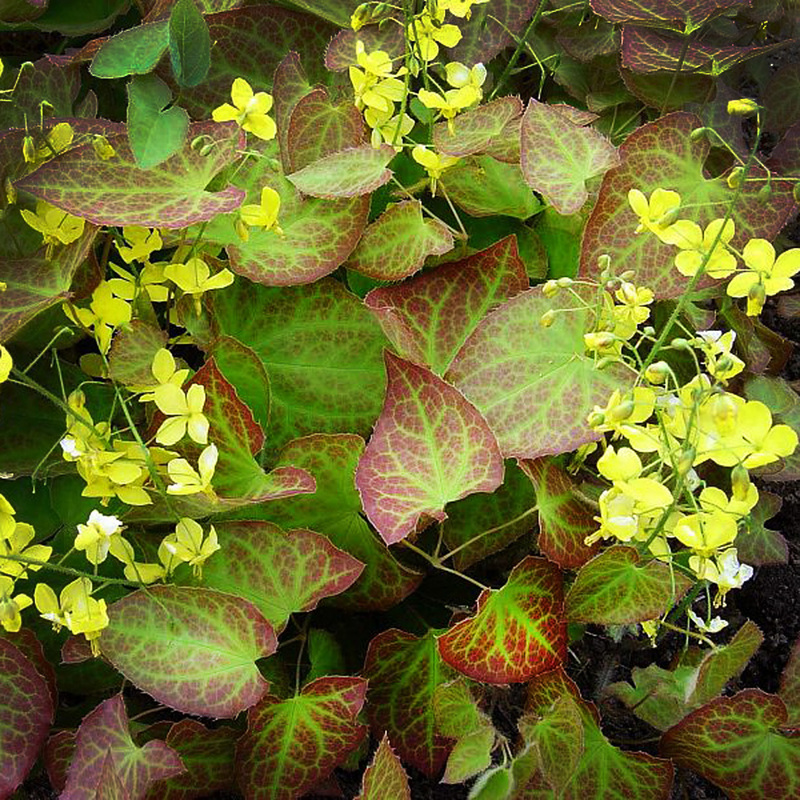 Epimedium x perralchicum ‘Frohnleitun’, forms beautiful spreading evergreen ground cover and has the most wonderfully delicate yellow flowers. Perfect for creating wonderful flashes of brightness amongst the mottled greens and reds of it’s equally fabulous foliage. Like I said, I love epimediums. Easy to miss, Asplenium trichomanes or Maidenhair Spleenwort, whilst delicate looking is actually extremely hardy (H6 - which is down to −20 °C). The leaves of this species are composed of numerous tiny leaflets held onto a wiry deep brown central stem which comes from the centre of the rosette. Numerous rosettes make a clump.